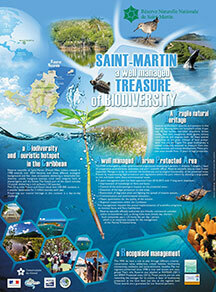 The Réserve Naturelle of Saint Martin does a scientific study of the ocean’s depths since 2007. Each year, they make a repertory of all coral less than two centimeters, count and measure conch and sea urchins, inventory underwater plants, and verify the layers covering of the substratum. Underwater plant beds provide a nursery for numerous species and offer them protection and food. These plants represent a fragile, endangered ecosystem, that plays a determining role in the purification of coastal waters. The coral reefs protect the coast from swells. The coral also serves as a habitat for thousands of species—for food, refuge and nurseries. Boat anchors pull up underwater plants and damage the coral, while chains destroy them all along the length of the links, and it takes decades for some of these species to recover and regenerate. That is why it is essential for boats to use the mooring buoys put at their disposal or drop their anchors in sandy areas only. It is forbidden to break or damage the reefs with fins. Fishing is prohibited in the entire Réserve Naturelle, as well as removal of anything animal or vegetal. Located at the intersection of the sea and the land, the salt ponds and their mangroves shelter a rich variety of fauna from both of these environments : 85 species of birds live there, of which 55 are protected. The ponds attenuate flooding after heavy rains, protect the shoreline, settle sediment and purify the water before it returns to the sea. Officially very well protected ¬—they are the beneficiaries of a biotope protection order, they belong to the Littoral Conservancy, are managed by the Réserve Naturelle, and since May 1, 2012 are even listed under the Ramsar Convention— but yet the 14 protected salt ponds are under an enormous amount of pressure and threats: depositing of debris as well as assorted trash and refuse, untreated water from septic systems, unauthorized cutting of the mangroves... In 2010 and 2011, two field studies and a series of analyses and observations took place to better understand their characteristics. The plateau formed by the islands of Saint Martin, Anguilla, and Saint Barthélemy is a reproduction zone for humpback whales. Nine species of marine mammals can be seen and, from January through May, divers may have the opportunity to hear the songs of the males, who can vocalize for as long 30 minutes before coming to the surface to breathe. At the same time, the dolphins like to come close to the prow of the boats and it is not unusual to observe them in the waters near Rocher Créole or Tintamare. 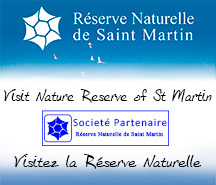 At the initiative of the AGOA mammal sanctuary (see the following pages), of which the Réserve de Saint-Martin is a partner, the third scientific study of marine mammals took place in March 2012 between Saint Martin, Anguilla, and Saint Barth and the zone around Saba, Sint Eustatia and the Saba Bank. Four species of dolphins were observed, as well as several sperm whales. Several songs by humpback whales were recorded. There are 85 species of birds –among which the great egret, the snowy egret, the red-tailed tropicbird, the bridled tern, the Herminier puffin, the little tern and of course the pelican— present in Saint Martin, and 55 of these species are protected. Several species are the subject of a scientific study, including the brown noddy, a protected species that nests on the cliffs of Tintamare. Frightened by the presence of humans, the brown noddy has been known to destroy its own nest. It is therefore prohibited for boats to anchor in North Cove Bay, and for passengers to gain access to this sector. Erosion of the cliffs and predators such as rats are also among the reasons the brown noddy is getting rare on Tintamare. So it is extremely important not to leave any remains of food on the beach, so as not to aid in the proliferation of rats. In 1998, when the Réserve Naturelle was created, a total of 480 different species of flora and fauna were estimated to exist in the various zones on land and at sea. But that was before april 2012, when a scientific mission listed more than 700 marine species! This inventory of fauna was done with the support of seven university professors from United States, Brasil and France. The three classifications included in this study are crustaceans (shrimp, crabs...), mollusks (slugs, shellfish...), and echinoderms (sea urchins, starfish, ophiuroids...). As part of this project, the scientific researchers did dives to take samples of the underwater milieu —sand, mud, rock, grasses, coral reefs— during the day as well as at night, in order not to miss nocturnal species. They sometimes used an underwater vacuum or a brush to capture the smallest species (less than 1 centimeter). The objective is to create a catalogue combining photos of all the species that were observed, both male and female. These results confirm the importance of the natural marine resources in the Réserve.